With a huge blizzard bearing down on the mid-Atlantic region, people around here are in a bit of a panic. Store shelves are empty of essential French toast supplies, bottled water, and batteries, and lines at gas stations are stretching out into the street and blocking traffic. 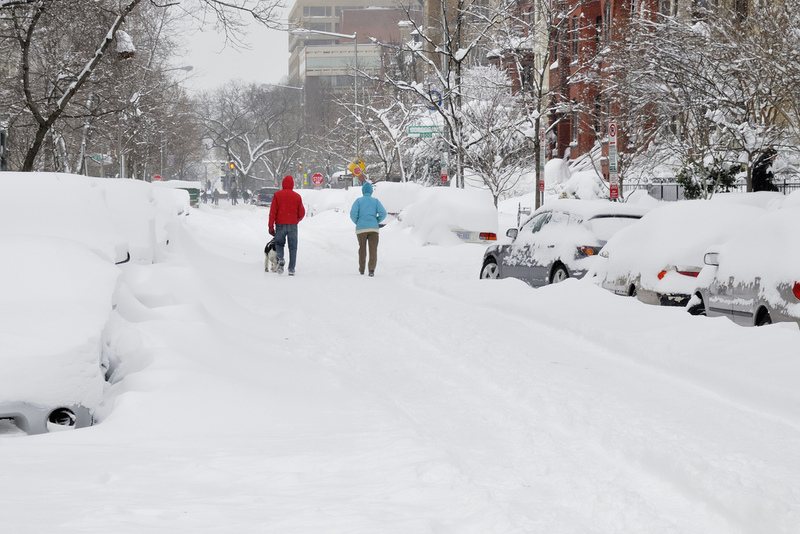 It’s not necessarily overkill, as much as I’d like to make fun of everyone – even the more conservative estimates are predicting that DC will be shivering under two feet of wet snow by Sunday morning. There are hundreds of excellent emergency-preparedness articles online, published by people who know what they’re talking about. You can find storm and blizzard tips from the American Red Cross. Weather websites and networks. The federal government. You should read them and do whatever you can to get ready for extreme weather. Take this seriously. But they’re not giving you the whole story. I’m from Montreal. I know blizzards, and I know a bunch of little tricks that will help you weather the storm a lot easier. Count on the pros for survival. I’ll help make your survival less miserable. If the forecast calls for heavy winds along with several inches of snow, you’ll have snow drifts that can make it hard to get to the shed or wherever else your snow shovels and snow-melting salt are stored. Bringing it to the front porch isn’t enough – you need at least one shovel and some salt inside in case you’re faced with a wall of snow when you open the front door. This doesn’t apply to snowblowers unless you have an incredibly spacious foyer. Those scrapers and sweepers aren’t going to do you any good locked up in your trunk. Leaving them in your car in general is a good idea for when you’re out and about, but when you’re parking the car and getting ready to hunker down for the duration of the storm, bring the snow-removers into the house with you and leave them near the door. In a pinch, a kitchen broom works to sweep off a car, too, but if you’ve got a tool you like, why not have it ready to go? If you have a driveway and not a garage (or a garage too full of junk to get your car in there), park your car close to the street instead of close to the house. You’ll have to walk further to get to it, but you won’t need to clear out as much snow behind it to get it out into the street. Be careful not to be too close to the edge, because you don’t want a snowplow taking off your bumper. If you have to park in the street because you don’t have a driveway, my heart goes out to you. Best of luck defending your cleared spot from the vultures. If the power goes out, you won’t have many options for cooking, so emergency planning dictates you stock up on protein bars and trail mix and other nutritious foods that don’t need heating. But if you have a grill out on the deck, you can heat up almost anything using a heavy pan (or one you don’t care about scorching). Pick up some propane before the storm, roll the grill a little closer to the door, and then once the winds die down you can wrap up in a parka and heat yourself up some water for cocoa. Don’t be a hero and go out during the blizzard, please! Everything you can think of. Phones and tablets that can connect to the internet are obviously essential, but do you have laptops you can play movies or games on? Mp3 players you can load up with podcasts and music? Even old cell phones you never got around to recycling – if they still work, you can use them to play games and music, even if they’re not connected to any network. If your power goes out, you’re going to be bored and in the dark, so you may as well have as many toys as possible charged and ready to go. Yeah, the water will probably still work if the power’s out, unless you’re on a well system with a pump, but who wants to shower in cold water when the heat isn’t working? Take advantage of the calm before the storm and hop into a hot shower. You might not get a chance to wash clothes or dishes for a few days, so check that you have enough clean stuff to get you through a week. If you don’t, a last-minute dishwasher load now can save you the headache of trying to wash off plates in icy water later. You might need a few layers of warm clothes, too, so make sure your sweatshirts and fluffy socks are all clean and dry. This is especially important if you’ll need to do some snow clearing – between sweat and snow, you’ll be soaked, and you will need extra sets of clothes to change into after every round with the shovel. Don’t clean up like you’re having guests over, but clear the floors to avoid tripping over things in the dark. I have a toddler, so this is impossible to achieve, but there’s hope for many of you. Also look around for breakables on counters and tables, and move them so they can’t get knocked over when you stub a toe on a table leg and hop around cursing. 9. Make essentials easy to find. Extra hats and gloves and thick socks for outside? Fill up a tote bag by the front door so you can get at them easily. Stack warm blankets and snuggies and bathrobes wherever you’re planning on sleeping. Have a central charging location for all your electronics so you know where they all are. Sure, you bought protein bars and applesauce and cans of beans, but where did you put them all? It gets dark early, especially under blizzard conditions, and you don’t want to waste valuable flashlight time digging around in the pantry trying to find the granola. Make a pile of essentials where it’s easy to find. Put things like scissors or corkscrews nearby, if you’ll need those to access your eats and drinks. I get headaches when I skip my coffee, so I keep instant coffee around in case the power goes out and I can’t run my coffee maker. If you grind it extra fine it dissolves half-decently in cold water, but you can buy the Starbucks iced coffee packets now and save yourself that trouble. Alternatively, have a case of Coke where you can get at it and just pour it into a mug at 6am and use your imagination. 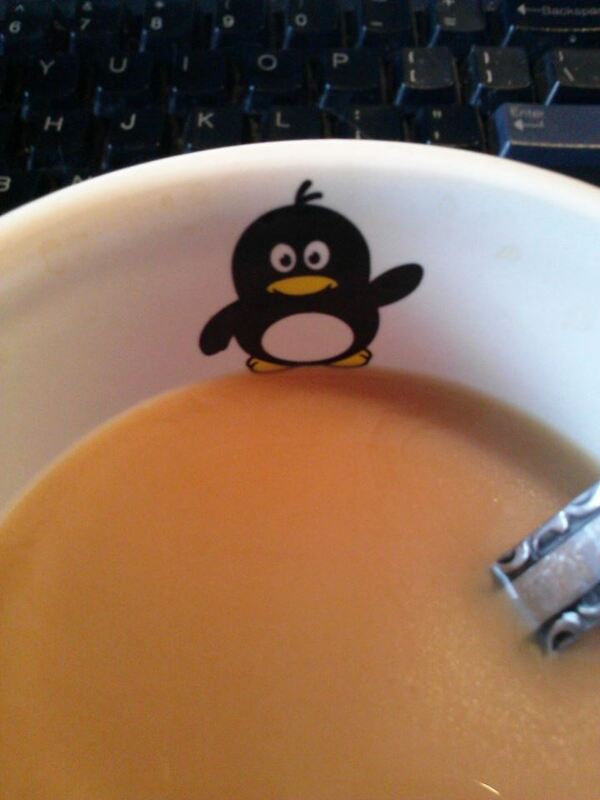 Coffee Penguin says stay warm! Good luck getting through this, everyone. I’ll see you on the other side. This entry was posted in Public Service Announcement and tagged blizzard, PSA, snowmageddon, snowpocalypse on January 22, 2016 by antijen.